I am hoping you can help with a switch/matrix box that I would like to purchase. Currently I have a traditional set-up in my home office: 2 desktop PC towers each with their separate two monitors for dual-screen use. - choose which monitor bank each desktop PC tower outputs to (using HDMI or DVI - currently 1080p but eventually 4k). For instance, I will want Tower 1 to output to the B monitors and Tower 2 to output to the A monitors and vice-versa. See diagram below. - Importantly, I will need this to work simultaneously so both desktop PCs can be usable at the same time. - I will never need to mix monitors banks [i.e. 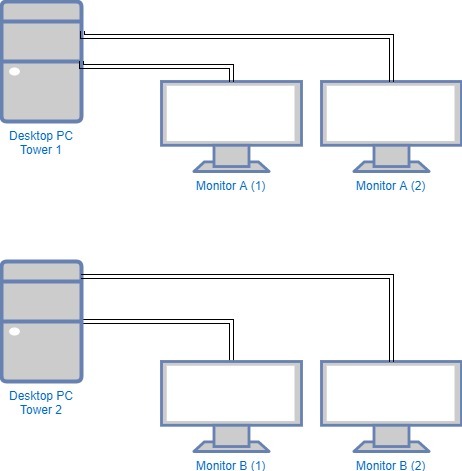 Monitor A (1) with Monitor B (2)]. - I use wireless keyboard and mice on both desktops and will physically switch these around when required. - audio is not a requirement. Hope this makes sense - I would really appreciate it if you could advise me the type of switch/box etc I might need and any recommendations you may have. 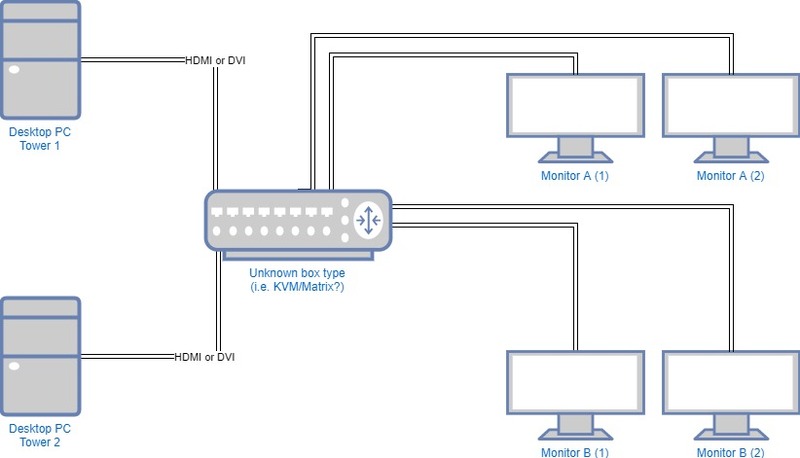 It sounds as though you would need a Dual Head KVM Switch however this would not allow you to disable one monitor from PC1 and one monitor from PC2. It would always switch both displays at once to either PC1 or PC2. We also do not recommend using wireless mice or keyboards on any KVM product as they almost always cause incompatibility issues.